Vinica Retreat Centre is a place of Diamond Way Buddhism in the Karma Kagyu lineage of Tibetan Buddhism. 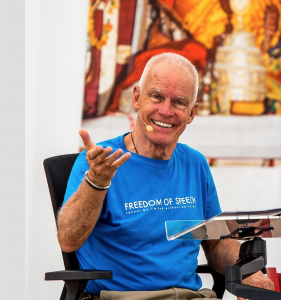 The retreat centre has been founded by Lama Ole Nydahl in 1996 and ever since we have been developing it step by step. Lama Ole gave three Phowa courses there and has visited the centre multiple times to bless it and share his guidance. We use the centre to meet with Buddha’s teachings and deepen our understanding through meditation. We have regular meditation courses through the year and aim at having regular meditation weekend each month. Although the place is still in development, there is a house and a big gompa. Electricity comes from a solar system and water (which needs to be preserved) from a set of underground reservoirs. We are constantly working to expand the centre and improve the conditions for meditation and development. The name given to the center by Lama Ole Nydahl is “Light Rays of Great Bliss”. Together, with many friends, you can be a part of this development. When you have the time, come to meditate and work with us. The availability of sufficient financial resources is also an important cause for all this development.